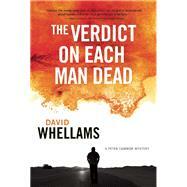 Peter Cammon, now retired from New Scotland Yard, is drawn into a confrontation with evil in a most unlikely setting. The former chief inspector finds himself in the suburbs of Salt Lake City, Utah, chasing a depraved man who may have deep terrorist connections. When a killer attacks on tranquil Hollis Street, the neighbours seem apathetic  silent to the point of complicity. A resident has been beheaded, her husband has disappeared, and there is no obvious perpetrator. A drug dealer? A terrorist? An angry neighbour? Peter joins the manhunt and is shocked to discover a link from the killer to the Unabomber and Oklahoma City bombing cases, files Peter himself worked on during the 1990s. In order to trap the killer-terrorist, Peter and his acquaintance in local law enforcement, Henry Pastern, must strike unholy alliances with corrupt cops, Mexican drug lords, and the Unabomber himself. Will Peter have to bend the law and embrace the rules of the Old West to stop this psychopath? David Whellams worked for 30 years in criminal law and amending the Criminal Code in such areas as dangerous offenders and terrorism. The first two books in his Peter Cammon Mystery series are Walking Into the Ocean and The Drowned Man. He lives in Ottawa, Ontario.